Protecting Nambia’s national parks is a daunting challenge. Conservation drones like the SurVoyeur have been touted as a useful and potentially transformative technology, especially for anti-poaching efforts. Noci is constantly testing and problematizing the usefulness of conservation drone technology in the context of the African landscape. His work will pave the way for the use of small drones for conservation work in the years to come. Center for the Study of the Drone How did you become involved with the development, construction and operation of drones? Joe Noci I have lived in Namibia now for almost 8 years having relocated here from South Africa, originally from Johannesburg. My career was mainly in the military aeronautical environment, with the last 10 years thereof in UAVs (Unmanned Aerial Vehicles). I started in that company as Senior Manager of the R&D division and during the years managing the UAV group developed the skills required. Providing a high reliability, rugged UAV system, fitting a user’s mission requirement and slotting neatly into the user’s logistics capabilities is a far cry from a DIY foamy flyer, and that is reflected in the resulting performance and cost. I progressed to the position of Director and Vice President in that company, a major player in the defense industry. My good wife was also Vice President in the same company, and Director of all software system development for all programs. So it was natural that we formed a good team when we decided to abscond from the corporate world and focused our capabilities and enthusiasm toward more conservation orientated directions. Our exit from the corporate world is not a new story—simply put, we suffered burn-out. We put all our energy and time into the business, leaving little time for life that was passing us by. We did manage a few weeks of vacation each year, and those weeks took place mainly in Namibia and Botswana, since we loved the bush and desert, the wide open spaces of Africa and its wildlife. We settled in Namibia, laid new roots here, in a small town called Swakopmund, on the Central West Coast, about 40 meters from the Atlantic Ocean. On arrival we opened our ‘dream’ business, a small Italian bistro and bakery. It became a huge success and proceeded to consume us totally. So, we sold the business and became involved in conservation. Obviously, we could not suppress our desire to use our UAV knowledge to the benefit of our ventures. Drone When did you first become interested in using drones for conservation in Namibia? Noci We started our UAV development about one and a half years after arriving here, around 2008, 2009. We had participated a number of times in the annual vulture-counting programs, where we flew annually around 15,000 km in a 4-seater Cessna as spotters, trying to detect vulture nests in the tree tops in the nesting areas of the Namibian desert regions. On detection we would log the GPS position, and then when all the flying was done, we would return in 4X4 vehicles to each location, extend a long ladder to the top of the tree, climb and retrieve the vulture chick, weigh it , measure it, categorize it, tag it and return it to the nest. This count is done annually and an active database is maintained that helps in the analysis of the effects of ‘progress’—roads, mines, etc—on the vulture population. However, the GPS position tagged in flight could be in error by many trees, and as many of the trees in the vicinity of the correct one may have a nest in its top, one was never sure of the actual tree you had to climb. This meant extending the heavy multisection ladder, some 20 meters tall, up against the tree, and climbing up between the vicious thorny branches, only to find no nest—wrong tree. So we developed a small UAV that we would launch at the site, viewing all the tree tops from on high, seeing which tree we needed to climb. And so it grew, the concept of using the UAV for observation in an anti-poaching program grew from this. Drone Do you consider yourself part of the DIY drone movement and that plane to be a DIY plane? Noci I suppose DIY means different things to different people. SurVoyeur is certainly DIY to me—I designed it and I manufacture it completely on my own. I have no employees building any part of it; I do it all. So production is limited to around 6 to 8 a year, and the income from it covers its cost—we will never become rich from this! It uses components purchased from model hobby shops. The composite parts are all made by myself, as well as all the molds and jigs. The autopilot and navigation system is designed by myself and manufactured for us by a production house in South Africa. All the autopilot and ground station software is created and written by my good wife, Gisela. So, I believe that qualifies as DIY, although it may not be open source, which is a different thing. I suppose that DIY is really a relative concept. An individual will do himself what he can do with the tools and expertise available to him, and that’s DIY. I also believe that a successful system needs local support. It is no use having some American drone donated to an African country, for example, with no follow-on support, spares supply, etc. As the staff turnover is high in the national parks environment, new recruits will require training, and the cost of bringing the foreign company out again to train people most often exceeds the value of the UAV in the first place. In addition, since large proportions of the conservation efforts endure through generous donations by donor countries, the available cash for logistics support for the ensuing years after delivery is often an unknown, resulting in derelict systems after a few years. Drone How do you think relatively inexpensive DIY drones can impact the world of conservation, and what do you see as some of their limitations? Noci I have had many a debate on this subject. There are many applications and situations where unmanned aircraft can positively benefit society and wildlife security and conservation. 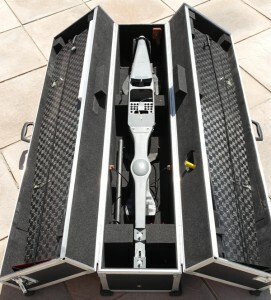 However, by no stretch of the imagination are UAVs the silver bullet. In many cases UAVs are the square peg forced into the round hole. The application of a UAV is faddy, fun, exciting and trendy, and this often makes the UAV a problem in search of a solution. We have used UAVs extensively here in Namibia, in many applications and conditions, and there are many problems in application, as well as many successes. In addition, the uninitiated user believes the UAV is a cheap alternative to hiring a fixed-wing plane and pilot, and flying reconnaissance. This will never be the case. The UAV is slower, has much less endurance, and has only one eye, the video camera or whatever, which has a very narrow field of view compared to that of the human eye. A spotter in a plane can see a square kilometer at a time at 200 meters above ground. 70% of that area is in his peripheral vision. The spotter can easily and quickly move his head to any area of interest, lock eyes onto a target and the head is naturally stabilized. The eye’s peripheral vision is very sensitive to any movement, with the eye refocusing on that movement in an instant. A video camera image from the UAV, as seen by the operator on the ground, will cover a ground area of at best 200 meters by 200 meters, 1/25th of the area of the eye. It is like looking through a cardboard tube from an aircraft, and trying to spot an animal on the ground. It rarely works. When closely coupled with conservation or security operations, it can work. For example, ground staff need to maintain constant patrols of hotspots and keep contact with local people for any insight into poaching or pending poaching activities. The UAV can then effectively be used as an extension of the patrol activities, but rarely as a global ‘eye in the sky’. There are other applications where the UAV is eminently suited: disaster relief. During the major rains some years ago in the North of Namibia, major areas were flooded and villages cut of from supply and contact for weeks—UAVs are able to assess the seriousness of the situation and assist in the provision of pinpoint aid. The use of UAVs to assess the level of deforestation taking place in certain countries is also a very effective use. Flood and hurricane damage assessment are ideal applications for such systems, but their use is fraught with pitfalls in the legalities of flight in civilian airspace. As the public open-mindedness has not kept pace with the rapid advancement of these technologies, so have the world’s flight authorities and lawmakers been embarrassingly asleep on their laurels. The use of UAVs for game counts is also often touted. We have attempted this in various ways, but it simply does not provide the same results and accuracy as does a fixed wing plane or a helicopter with human spotters. The poor field of view, the poor resolution of cheap video cameras, all count against the process. In addition, the animals remain stationary and are well camouflaged, and so not seen. The UAV presence is small and quiet. From a plane or helicopter, the animals run out from under the bushes and trees and the movement is easy to spot and count. 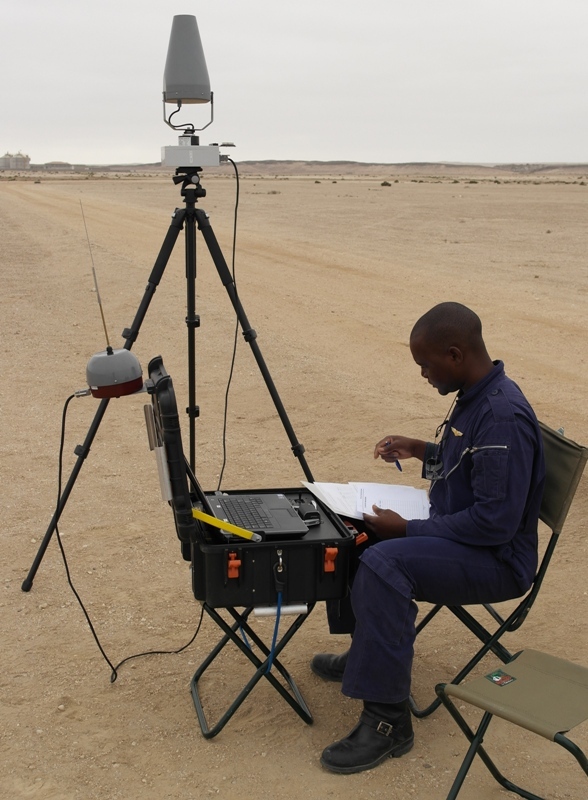 Drone In December 2013, you announced on your blog that the first Namibian pilot had completed training for the SurVoyeur MK-II. Can you speak a little bit about the build up to this program as well as any developments or findings through the use of this aircraft in the Etosha National Park since the end of 2013? Noci This pilot was certainly the first Namibian trained on the MK-II system, and training of further personnel is planned for in the next two months. However, we had already trained another pilot, in fact one of the head scientists at the Ministry Of Environment and Tourism (MET) and delivered to MET a MK-I system, the MK-II predecessor. The purpose of that system is to assist in crocodile counting along the rivers bordering the Northern parts of Namibia. This process is ongoing at present. The system in Etosha has been extensively used in an anti-poaching role along the North-Central border of Etosha, an area well known as a hotspot. It has proven effective also in detecting illegal entry into the park by local villagers and their cattle, who leave broken fences, an easy entrance for poachers. Since Etosha is also an international flamingo breeding ground, the UAV is also planned to be used for counting flamingos and their eggs during the breeding season. The MK-II system was procured by MET, from donor funding, during the early part of 2013, and we developed a number of its capabilities to suit the needs of the park operators. The pilot training was self developed, derived from the many training programs we had developed during our previous careers in UAV systems. Drone Was the SurVoyeur MK-II specifically developed for conservation use? 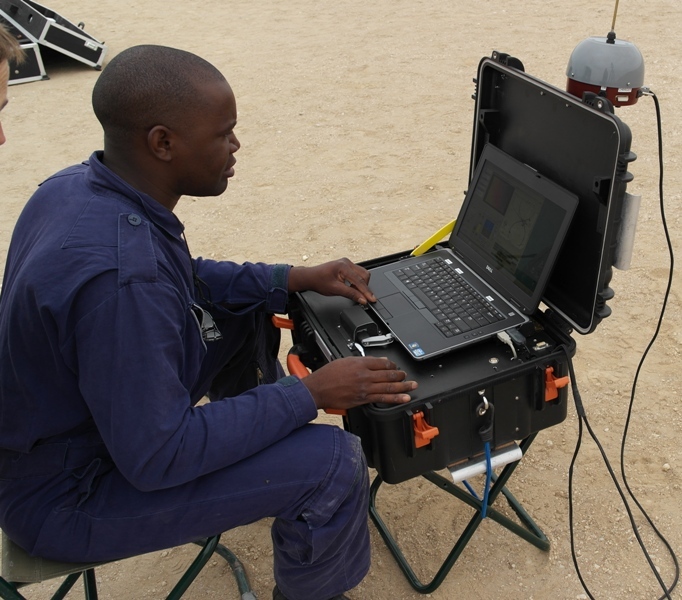 Noci In fact the MK-I system was the first fully automatic system we developed in Namibia, for client’s in land surveying and geo-referencing. The MK-II evolved since we diverged more into the conservation related area, and needed to be able to fit more sophisticated stabilized payloads, day and night infrared cameras, and such like. 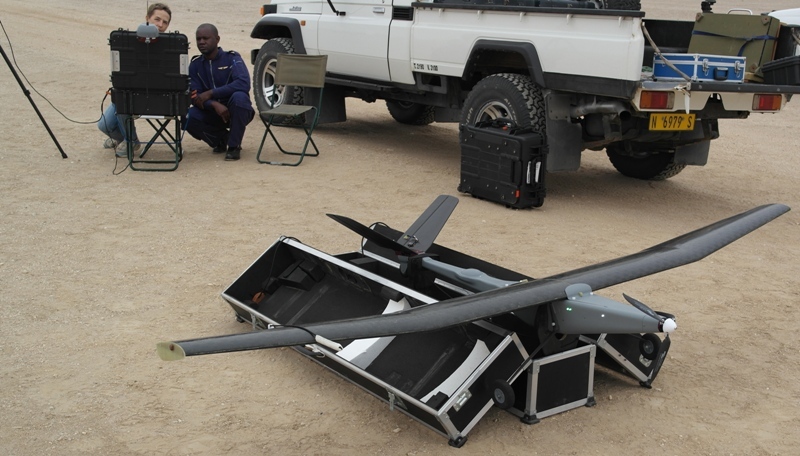 Drone Could you describe a typical mission for the SurVoyeur MK-II in Etosha? Missions are linked strongly to foot patrols, which are very regularly executed, albeit at non-regular or non-predictable times. Flights are sometimes co-incident with patrols, sometimes lagging and sometimes leading. Poachers often wait for the patrols to pass and then enter the areas—an eye in the sky makes this more difficult. Missions are also flown without foot patrols. The key element being to ensure that the surprise element is ever-present. Drone Is the drone in Etosha flown on a regular schedule? Drone Is anti-poaching work in Namibia dangerous, confrontational or stressful? Noci Unfortunately, here again, I cannot provide information in this regard. Drone What does a drone need to be equipped with to fight poaching? And then, even if the best UAV is fitted with the best cameras, real-time observation by ground crew is complex. Infrared images are quite different from day images, operator eye training is imperative, and eye and mental fatigue while viewing is a big problem. All these things considered, it requires a concerted and well thought out approach, with the correct support and logistics management, as well as selection and training of reliable operators, for such applications to be effective. That said, on a sub-application level, UAVs can play a big role. When ground patrols detect a problem, the UAV can be sent over the area to observe and assist the patrol to decide on the best approach, avoid ambushes,and so on. Tracker dogs can be released by their handler to route out the poachers, the dog fitted with a GPS tracking transmitter, and the UAV can follow the dog, with the infrared camera fixed on the dog. The handler then sees what the dog sees, and can follow the dog. It is this type of concept that we focus on and assist the user in establishing effective patrol coordination coupled to the use on the UAV. The UAV cannot be a solution on its own. Drone Do the national park workers see the benefits of this technology? Noci Absolutely, this is viewed by all the people involved as a technology capable of extensively leveraging the security task. It is also seen as vital to asses the potential level of risk at the point of confrontation, number of poacher elements involved, etc. Drone How do you feel about the involvement of the public in fighting environmental crimes, such as poaching, using UAVs? Do you conceive of any risk in this pursuit? I think the public involvement in the further development of the technology is to be commended—such as the huge clan of DIY-droners, for example—but their general involvement at the cliff face is in fact doing more to harm the reputation of UAVs in these applications. And the use of fully commercial off-the-shelf UAV systems is not to be commended in all applications. The use of the ISM frequencies for video, telemetry and data control links is unsound, especially in the environments where poaching of high value animals takes place. One must always remember that whatever cheap technology the avid DIY Droner may use for these elements, the poacher has just as much access to said items. They can also have video and telemetry receivers, all the open source software, ground stations, etc, and can easily detect these UAVs themselves. After all, they have used helicopters and veterinary surgeons to dart and poach rhino. I strongly believe the UAVs used for security monitoring and anti-poaching must by definition differ from a conservation type UAV, not only from a communication security point of view, but also from the type of payload, its performance, etc. Having generalized, I have to also say that there are many conservation orientated groups, for example, Conservation Drones ( Lian Pin Koh and company) who are doing exemplary work. Maybe they do not fall into the classification of “public” since they are professionals in their own fields. Nevertheless, their work is proving beneficial. It is well coordinated and highly professional. Not the same can always be said of a group of ‘geeks’ with the latest DIY foamy, flying in and around sensitive areas. Drone Do you think due to the nature of the work, anti-poaching efforts will ever become transparent and the information of their use available to the public? Noci This is a double-edged sword. The uninformed public today is paranoid about UAVs. The use of UAVs, in fact the very existence of UAVs, is considered a threat. If I take a picture with my camera of someone in a park, as part of the scenery, the public won’t bat an eyelid. If I use the same camera in my UAV to do the same thing, that public becomes incensed and enraged. I do not believe any amount of informing or transparency will change that at all. The technology of UAVs has made a quantum leap in a very short time, and left people in its wake. It’s sort of like when the first belching, stinking, popping combustion engined car took to the roads. But, UAVs are here to stay, and will spurn billions in business, and like anything else, will both benefit and burden mankind. I do not believe all application of UAVs in anti poaching should be made public. The very effort in these exercises is to flout and capture the poachers, and to try remain one step ahead of them. What purpose will be served by making transparent, for example, where UAVs are being used for anti-poaching, when they fly, what sensors they carry, how effective they are and what successes they have had? Drone Are you working on any other conservation drones? Noci We are always working on new things. Presently we are in a joint program with a South African company developing a much larger UAV—around 25kg, with up to 6 hours endurance, and with more sophisticated payloads. This will hopefully begin to serve the long-endurance, high performance applications previously mentioned. Drone What are your goals for the use of conservation drones in Namibia over the next several years? In Namibia we are working hard at providing conservation and security UAV solutions in a more widespread manner, and moving into the more unconventional areas—for example, using a UAV to track and observe the whereabouts of the GPS-collared Namibian desert lions, to help reduce the lion-human conflict and subsequent demise of these lions. We also will be using the UAV to track the lions deep in the desert dunes to research the lions’ lifestyle and feeding habits, research which to date has not been attempted due to the harsh nature of the environment. Since we are not a large company selling worldwide for profit, we try to focus on the issues in our own backyard, certainly in southern Africa. Our association with the South African company now also allows us to grow this endeavor, as they will take over the UAV production and technical support supply, while we focus on the development of the systems and their application in the real world.